Essays by Walter Seitter, Frank Reijnders and Knut Eberling. Introduction by Gijs van Tuyl and Annelie Lütgens. For some years now, painting has been the subject of renewed interest in the art world, taking prime place in such international exhibitions as Pittura Immedia, Troublespot Painting, Painting at the Edge of the World, and Urgent Painting. In this same field of exploration and debate, Painting Pictures considers the possibilities of painting in the age of photographic and digital media. Let those calls for the death of painting after photography ring hollow--Painting Pictures shows how painting reinvents itself in the face of photography, television, advertising, cinema and the computer. Featured is work by dozens of artists who bring painting into the digital age from a variety of approaches, including Jeff Koons, Fiona Rae, Richard Patterson, Matthew Ritchie, Takashi Murakami, Franz Ackermann, Lisa Ruyter, Sarah Morris, Monique Prieto, Brain Calvin, Inka Essenhigh and Fred Tomaselli. 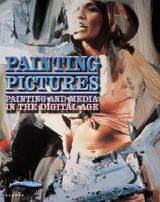 These artists often make use of new media for their paintings by appropriating digital pictures or by using the computer as sketchbook. Conversely, new-media artists often cite picture stories and painting gestures in their photographs and videos--and so, within these pages, the reader will also find work by Wolfgang Tillmans, Sarah Jones, Bill Viola, Massimo Vitali, Andreas Gursky, Jeff Wall, Doug Aitken and others.